The Model 2R PENBERTHY Submersible automatic sump drainers are reliable, fail-safe units that create a powerful pumping action by using either water or saturated steam as the operating medium, without electricity. Penberthy submersible automatic sump drainers provide practical solutions in environments with limited access and no electrical service (such as maintenance pits for underground cable, wiring or piping). 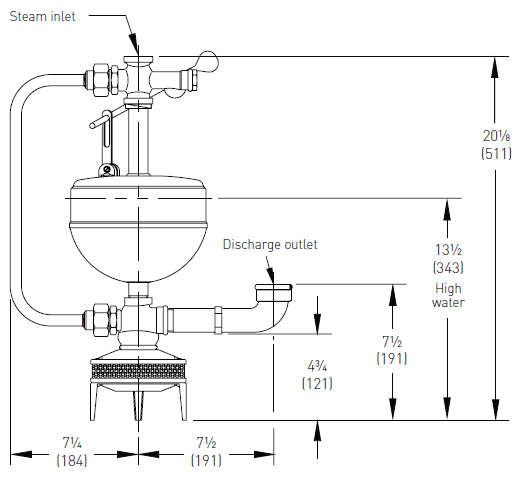 They function effectively in either primary pumping operations or on standby to operate when electrical failure occurs. The units cannot be flooded, require minimal upkeep and are unaffected by power outages. Capitalizing on a time-proven design, these units are available in either a space-saving non-loop design or an efficient loop configuration. Model 2R-W is non-loop and operates with a liquid motive. Model 2R-WL is a loop design that operates with a liquid motive. Model 2R-S is non-loop and uses a steam motive. Model 2R-SL is a loop design that operates with a steam motive. Their operation is simple. 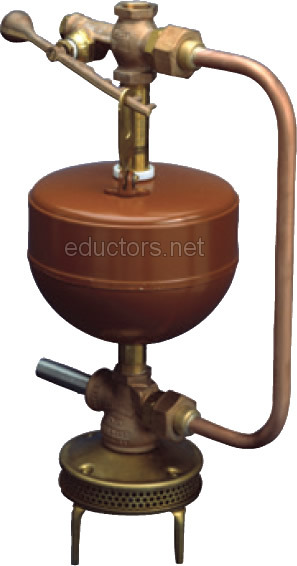 A copper float, rising with the water level, slides on a center tube to activate a low-friction valve automatically which ‘turns the pump on’. No moving parts in jet pump to wear out. Applications for these models include sump evacuation, steam service and boiler room operations, general manufacturing installations, in-plant services and manufacturing processes of many types.